The IPython message specification is versioned independently of IPython. The current version of the specification is 5.0. Control: This channel is identical to Shell, but operates on a separate socket, to allow important messages to avoid queueing behind execution requests (e.g. shutdown or abort). # Any metadata associated with the message. Changed in version 5.0: version key added to the header. This message format exists at a high level, but does not describe the actual implementation at the wire level in zeromq. The canonical implementation of the message spec is our Session class. This section should only be relevant to non-Python consumers of the protocol. Python consumers should simply import and use IPython’s own implementation of the wire protocol in the IPython.kernel.zmq.session.Session object. The front of the message is the ZeroMQ routing prefix, which can be zero or more socket identities. This is every piece of the message prior to the delimiter key <IDS|MSG>. In the case of IOPub, there should be just one prefix component, which is the topic for IOPub subscribers, e.g. execute_result, display_data. After the delimiter is the HMAC signature of the message, used for authentication. If authentication is disabled, this should be an empty string. By default, the hashing function used for computing these signatures is sha256. To disable authentication and signature checking, set the key field of a connection file to an empty string. After the signature is the actual message, always in four frames of bytes. The four dictionaries that compose a message are serialized separately, in the order of header, parent header, metadata, and content. These can be serialized by any function that turns a dict into bytes. The default and most common serialization is JSON, but msgpack and pickle are common alternatives. After the serialized dicts are zero to many raw data buffers, which can be used by message types that support binary data (mainly apply and data_pub). # this code as quietly as possible. # is forced to be False. # user's dict. The rich display-data representation of each will be evaluated after execution. # See the display_data content for the structure of the representation data. # Some frontends do not support stdin requests. # a StdinNotImplementedError will be raised. # A boolean flag, which, if True, does not abort the execution queue, if an exception is encountered. # This allows the queued execution of multiple execute_requests, even if they generate exceptions. Changed in version 5.0: user_variables removed, because it is redundant with user_expressions. The code field contains a single string (possibly multiline) to be executed. The user_expressions field deserves a detailed explanation. In the past, IPython had the notion of a prompt string that allowed arbitrary code to be evaluated, and this was put to good use by many in creating prompts that displayed system status, path information, and even more esoteric uses like remote instrument status acquired over the network. But now that IPython has a clean separation between the kernel and the clients, the kernel has no prompt knowledge; prompts are a frontend feature, and it should be even possible for different frontends to display different prompts while interacting with the same kernel. user_expressions can be used to retrieve this information. In order to obtain the current execution counter for the purposes of displaying input prompts, frontends may make an execution request with an empty code string and silent=True. The kernel should have a single, monotonically increasing counter of all execution requests that are made with store_history=True. This counter is used to populate the In[n] and Out[n] prompts. The value of this counter will be returned as the execution_count field of all execute_reply and execute_input messages. # 'payload' will be a list of payload dicts, and is optional. # payloads are considered deprecated. # which is a string classifying the payload (e.g. 'page'). # Results for the user_expressions. Changed in version 5.0: user_variables is removed, use user_expressions instead. Payloads are considered deprecated, though their replacement is not yet implemented. page: display data in a pager. Pager output is used for introspection, or other displayed information that’s not considered output. Pager payloads are generally displayed in a separate pane, that can be viewed alongside code, and are not included in notebook documents. # mime-bundle of data to display in the pager. used to create new cells in the notebook, or set the next input in a console interface. The main example being %load. # a cell. Ignored in console UIs. edit: open a file for editing. Triggered by %edit. Only the QtConsole currently supports edit payloads. Allows the kernel to request exit, e.g. via %exit in IPython. Only for console frontends. Code can be inspected to show useful information to the user. It is up to the Kernel to decide what information should be displayed, and its formatting. # this may be up to an entire multiline cell. Changed in version 5.0: object_info_request renamed to inspect_request. Changed in version 5.0: name key replaced with code and cursor_pos, moving the lexing responsibility to the kernel. The reply is a mime-bundle, like a display_data message, which should be a formatted representation of information about the context. In the notebook, this is used to show tooltips over function calls, etc. # 'ok' if the request succeeded or 'error', with error information as in all other replies. Changed in version 5.0: object_info_reply renamed to inspect_reply. Changed in version 5.0: Reply is changed from structured data to a mime bundle, allowing formatting decisions to be made by the kernel. Changed in version 5.0: line, block, and text keys are removed in favor of a single code for context. Lexing is up to the kernel. # The range of text that should be replaced by the above matches when a completion is accepted. # typically cursor_end is the same as cursor_pos in the request. # Information that frontend plugins might use for extra display information about completions. matched_text is removed in favor of cursor_start and cursor_end. metadata is added for extended information. # If hist_access_type is 'tail' or 'search', get the last n cells. # include duplicated history. Default is false. New in version 4.0: The key unique for history_request. When the user enters a line in a console style interface, the console must decide whether to immediately execute the current code, or whether to show a continuation prompt for further input. For instance, in Python a = 5 would be executed immediately, while for i in range(5): would expect further input. invalid code will typically be sent for execution, so that the user sees the error soonest. unknown - if the kernel is not able to determine this. The frontend should also handle the kernel not replying promptly. It may default to sending the code for execution, or it may implement simple fallback heuristics for whether to execute the code (e.g. execute after a blank line). Frontends may have ways to override this, forcing the code to be sent for execution or forcing a continuation prompt. # field does not exist. 'shell_port' : int,   # The port the shell ROUTER socket is listening on. 'iopub_port' : int,   # The port the PUB socket is listening on. 'stdin_port' : int,   # The port the stdin ROUTER socket is listening on. 'hb_port' : int,      # The port the heartbeat socket is listening on. If a client needs to know information about the kernel, it can make a request of the kernel’s information. This message can be used to fetch core information of the kernel, including language (e.g., Python), language version number and IPython version number, and the IPython message spec version number. # Version of messaging protocol. # there is any backward incompatible change. # there is any backward compatible change. # Name of the programming language in which kernel is implemented. 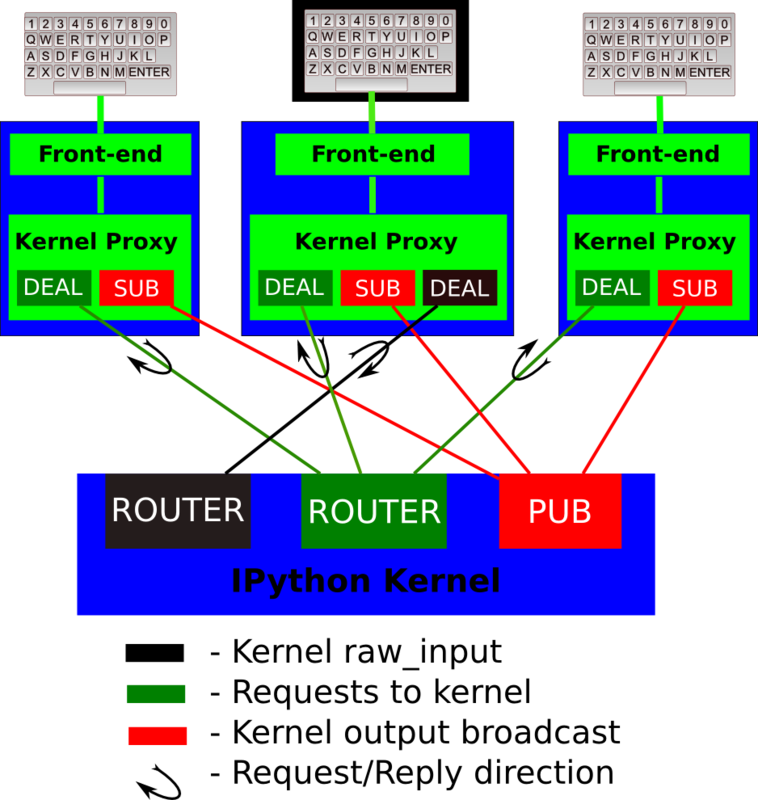 # Kernel included in IPython returns 'python'. # Only needed if it differs from the top level 'language' field. # Codemirror mode, for for highlighting in the notebook. # which may be desplayed in console environments. # Optional: A list of dictionaries, each with keys 'text' and 'url'. # These will be displayed in the help menu in the notebook UI. Refer to the lists of available Pygments lexers and codemirror modes for those fields. Changed in version 5.0: Versions changed from lists of integers to strings. Changed in version 5.0: ipython_version is removed. Changed in version 5.0: language_info, implementation, implementation_version, banner and help_links keys are added. Changed in version 5.0: ‘data’ key renamed to ‘text’ for conistency with the notebook format. This type of message is used to bring back data that should be displayed (text, html, svg, etc.) in the frontends. This data is published to all frontends. Each message can have multiple representations of the data; it is up to the frontend to decide which to use and how. A single message should contain all possible representations of the same information. Each representation should be a JSON’able data structure, and should be a valid MIME type. Do we use this message type for execute_result/displayhook? Probably not, because the displayhook also has to handle the Out prompt display. On the other hand we could put that information into the metadata section. The metadata contains any metadata that describes the output. Global keys are assumed to apply to the output as a whole. The metadata dict can also contain mime-type keys, which will be sub-dictionaries, which are interpreted as applying only to output of that type. Third parties should put any data they write into a single dict with a reasonably unique name to avoid conflicts. Changed in version 5.0: application/json data should be unpacked JSON data, not double-serialized as a JSON string. display_data lets you publish representations of data, such as images and html. This data_pub message lets you publish actual raw data, sent via message buffers. The interpretation of a sequence of data_pub messages for a given parent request should be to update a single namespace with subsequent results. No frontends directly handle data_pub messages at this time. It is currently only used by the client/engines in IPython.parallel, where engines may publish data to the Client, of which the Client can then publish representations via display_data to various frontends. To let all frontends know what code is being executed at any given time, these messages contain a re-broadcast of the code portion of an execute_request, along with the execution_count. Changed in version 5.0: pyin is renamed to execute_input. Results of an execution are published as an execute_result. These are identical to display_data messages, with the addition of an execution_count key. Results can have multiple simultaneous formats depending on its configuration. A plain text representation should always be provided in the text/plain mime-type. Frontends are free to display any or all of these according to its capabilities. Frontends should ignore mime-types they do not understand. The data itself is any JSON object and depends on the format. It is often, but not always a string. # data and metadata are identical to a display_data message. # i.e. the *result* of the execution. # The kernel will publish state 'starting' exactly once at process startup. Changed in version 5.0: Busy and idle messages should be sent before/after handling every message, not just execution. This message type is used to clear the output that is visible on the frontend. # existing output immediately before the new output is displayed. # Useful for creating simple animations with minimal flickering. Changed in version 4.1: stdout, stderr, and display boolean keys for selective clearing are removed, and wait is added. The selective clearing keys are ignored in v4 and the default behavior remains the same, so v4 clear_output messages will be safely handled by a v4.1 frontend. # Is the request for a password? # If so, the frontend shouldn't echo input. When password is True, the frontend should not echo the input as it is entered. Changed in version 5.0: password key added. The stdin socket of the client is required to have the same zmq IDENTITY as the client’s shell socket. Because of this, the input_request must be sent with the same IDENTITY routing prefix as the execute_reply in order for the frontend to receive the message. Clients send ping messages on a REQ socket, which are echoed right back from the Kernel’s REP socket. These are simple bytestrings, not full JSON messages described above. IPython 2.0 (msgspec v4.1) adds a messaging system for developers to add their own objects with Frontend and Kernel-side components, and allow them to communicate with each other. To do this, IPython adds a notion of a Comm, which exists on both sides, and can communicate in either direction. These messages are fully symmetrical - both the Kernel and the Frontend can send each message, and no messages expect a reply. The Kernel listens for these messages on the Shell channel, and the Frontend listens for them on the IOPub channel. Every Comm has an ID and a target name. The code handling the message on the receiving side is responsible for maintaining a mapping of target_name keys to constructors. After a comm_open message has been sent, there should be a corresponding Comm instance on both sides. The data key is always a dict and can be any extra JSON information used in initialization of the comm. If the target_name key is not found on the receiving side, then it should immediately reply with a comm_close message to avoid an inconsistent state. Comm messages are one-way communications to update comm state, used for synchronizing widget state, or simply requesting actions of a comm’s counterpart. Essentially, each comm pair defines their own message specification implemented inside the data dict. There are no expected replies (of course, one side can send another comm_msg in reply). Since comms live on both sides, when a comm is destroyed the other side must be notified. This is done with a comm_close message. Since comm messages can execute arbitrary user code, handlers should set the parent header and publish status busy / idle, just like an execute request.